Nikolas Jacob Cruz,19. Think for a moment, what woman in her right mind would date this sick-looking individual? Where is your rush-to-judgment in issuing an Executive Order to Broward County State Attorney Michael J. Satz demanding the death penalty for the alleged Douglas High School gunman, 19-year-old Nikolas Jacob Cruz? Or is that just reserved for Florida’s first black elected State Attorney Aramis D. Ayala? 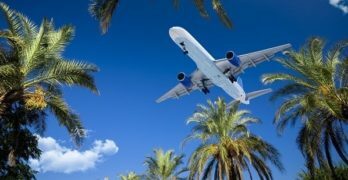 funeral expenses and travel expenses for everyone involved. It was truly sickening to hear you bring up the Pulse Nightclub shooting again as you did with Tampa Mayor Bob Buckhorn at the news conference after the apprehension of the suspected Tampa serial killer. Gov. Scott, your insincerity is ever so transparent as you come across very detached from reality. I personally find your character heartless, self-serving, and a disingenuous politician who clamors for more free airtime at every opportunity. In terms of recent school shootings, our children only mimic what they see and feel in society. And sadly, some very demented youths view gun violence with mass casualties as the only way to get attention. Since the alleged Douglas High School shooter did not turn the weapon on himself, it is apparent that he was seeking some kind of attention or notoriety. 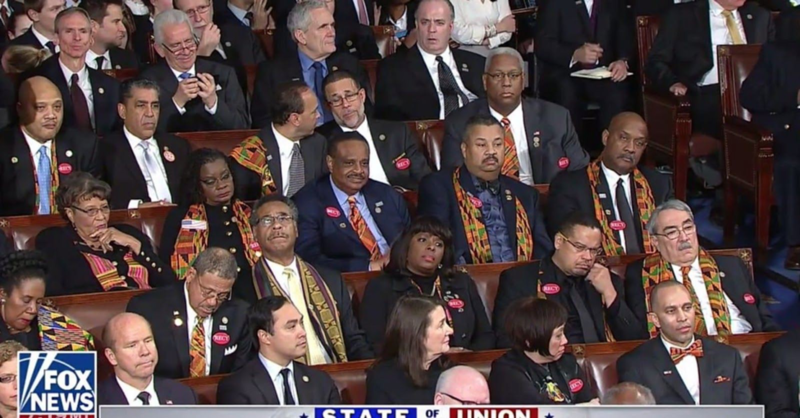 Democratic Members of Congress demeanor during President Donald Trump’s State of the Union Address. With divisive qualities such as the ones just mentioned, our nation’s elected officials have set the tone for the behavior of ordinary citizenry by their verbal violence of partisan political rhetoric. suspended student, named Nikolas Jacob Cruz, allegedly shot and killed 17 people at Marjory Stoneman Douglas High School in Parkland, Florida. 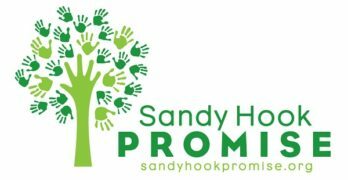 It was the deadliest school shooting since a gunman 20-year-old Adam Lanza on December 14, 2012, fatally shot 20 children between six and seven years old, as well as six adult staff members. Prior to driving to the school, he shot and killed his mother at their Newton, Connecticut home. Just how widespread is gun ownership? 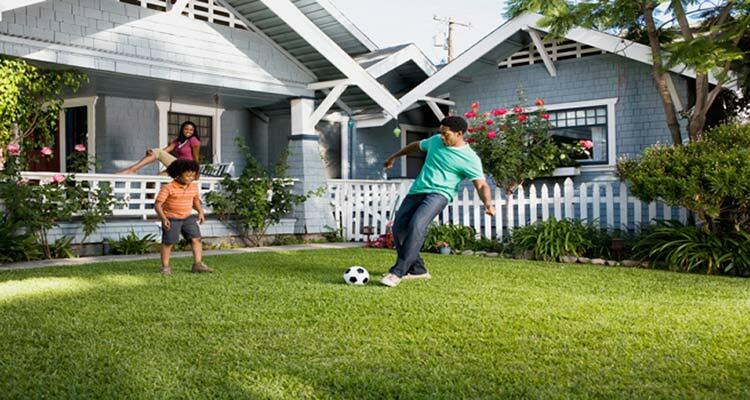 A February 2013 Pew Research Center survey found that 37% of adults reported having a gun in their household, with 24% saying they personally owned the gun and 13% saying it was owned by someone else in their home. The survey also found that 58% of people who did not have a gun in their household said that having a gun would make them feel uncomfortable. This is why often these psychotic killers are using military-style weapons. It is believed, and I agree with this assumption, that because of their inability to have normal relationships with women, or feeling inadequate about their ability to copulate, military-style weapons, “big guns” are used as a way to for these sick individuals to express or project their male sexual prowess. Gov. Scott, you are well aware that we have a mental health crisis in this state that has only gotten worse under your lack of leadership. What does it mean to be Baker Act? A Baker Act is a means of providing individualsget with emergency services and temporary detention for mental health evaluation and treatment when required, either on a voluntary or an involuntary basis. An adult person can be held for up to 72 hours unless ordered by the court. Of nearly 195,000 Floridians taken into custody for a Baker Act evaluation in fiscal year 2015-2016, the most recent data available, most were released with no follow-up. In Central Florida, no more than a fifth (1 in 5) of those cases make it to a court hearing on whether to require further treatment, and Miami-Dade County Judge Steve Leifman says that, statewide, less than 2 percent (1 in 50) are ultimately deemed a danger to themselves or others and committed to mental hospitals. Baker Act: Named after Maxine Eldridge Baker, a former Miami representative in the Florida House of Representatives, the 1971 law allows courts, law-enforcement officers, doctors and various mental-health professionals to initiate an examination for individuals believed to be mentally ill and having a “substantial likelihood” of causing “serious bodily harm” to themselves or someone else. The three-day time limit (72 hours) for the evaluation was imposed to protect people from being held indefinitely. After the exam, they must either be released, agree to voluntary treatment or have a court hearing scheduled to determine whether they can be kept longer. At that point, they have a right to an attorney. The most recent data, for fiscal year 2014, showed Florida ranked 51st out of 52 jurisdictions for total state mental health spending — behind 49 states and Washington, D.C. — at $36.05 per capita. The Sunshine State was only ahead of one jurisdiction: Puerto Rico, at $20.22. Mississippi spent three times as much on its mentally ill ($106.61) than Florida does. Months before authorities say Nikolas Cruz walked into his former high school and slaughtered 17 people, the troubled teen began showing what may have been warning signs he was bent on violence. “I’m going to be a professional school shooter,” a YouTube user with the screen name “Nikolas Cruz” posted in September. The 19-year-old had gotten expelled last year from Marjory Stoneman Douglas High School for undisclosed disciplinary reasons. A former Junior ROTC cadet, he bought a military-style AR-15 rifle. In fact, schoolmates weren’t surprised when Cruz was identified as the gunman in Wednesday’s rampage, said 17-year-old Dakota Mutchler. The FBI said it never spoke to the Florida teen. Why would the FBI investigate a troubled teen who says that “I’m going to be a professional school shooter”? It is likely because the FBI was too busy focusing on the fake Trump dossier! Gov. Scott, we are now learning that multiple warning signs were missed concerning the erratic behavior of 19-year-old Nikolas Jacob Cruz. The tragedy at Marjory Stoneman Douglas High School in Parkland, Florida, that left 17 innocent individuals dead did not have to happen. And yet you and Florida Attorney General Pam Bondi used that tragedy to bolster your pending announcement to run for the United States Senate. Your actions are unconscionable. But why should I be surprised when you displayed this same insensitive attitude as you did when you were the Chief Executive Officer of Columbia/HCA. Gov. Scott, having been involved in politics for more than 30 years, I know when a politician has purposely ignored my previous correspondence. Respectfully, I can deal with this because I know your character. 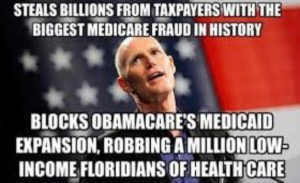 Rick Scott became the focus of the largest Medicare fraud case in U.S. history, spanning six states during a seven-year criminal probe. Mr. Scott resigned from Columbia/HCA four months later under pressure from the board of directors and was never charged with a crime. Gov. Scott, whether you personally accept responsibility or not, the culture of corporate corruption that you and your company participated in when you were the Chief Executive Officer of Columbia/HCA, is part of the reason why an untold number of individuals across this country are not receiving mental health care as well as affordable healthcare in general. After you were forced to resign, Columbia/HCA admitted to systematically overcharging the government by claiming marketing costs as reimbursable, by striking illegal deals with home care agencies, and by filing false data about use of hospital space. They also admitted fraudulently billing Medicare and other health programs by inflating the seriousness of diagnoses and to giving doctors partnerships in company hospitals as a kickback for the doctors referring patients to HCA. They filed false cost reports, fraudulently billing Medicare for home health care workers, and paid kickbacks in the sale of home health agencies and to doctors to refer patients———–all while, as you have stated, you were left out of the loop. Documentation from federal court records show that Columbia/HCA paid a record $1.7 billion in fines and pleaded guilty to 14 felony charges for a variety of transgressions. About $30 million in fines stemmed from illegal payments to doctors, a practice federal investigators traced back to El Paso, where you and Mr. Richard Rainwater began Columbia in 1987 with the purchase of two distressed hospitals. In all, civil lawsuits cost HCA more than $2 billion to settle. At the time, this was the largest fraud settlement in U.S. history. Again, Mr. Scott, you were reportedly paid $9.88 million in a settlement and left owning 10 million shares of stock worth over $350 million. The directors had been warned in the company’s annual public reports to stockholders that incentives Columbia/HCA offered doctors could run afoul of a federal anti-kickback law passed to limit or eliminate instances of conflicts of interest in Medicare and Medicaid. Mr. Scott, you have stated that you would have immediately stopped your former hospital company from committing Medicare fraud — if only “somebody would have told me something was wrong.” Sir, this lame explanation is absolutely an insult to my intelligence. $85 million, including more than $73 million of his own family’s money, into getting elected governor. In 2014, Governor Rick Scott pulled off a narrow victory against Charlie He set another state record for campaign spending to the tune of $100 million to do it. $13 million from his personal funds. eventually becoming the largest private for-profit healthcare company in the U.S.
Scott’s six million Columbia shares were worth $173.3 million. Mr. Rainwater’s combined stake of nine million shares of Columbia and HCA was valued at $259 million. Critics, including some lawmakers, contended that such business relationships were a blatant conflict because they could encourage physicians to order unnecessary treatments and jack up patient bills at hospitals where they have a financial interest. 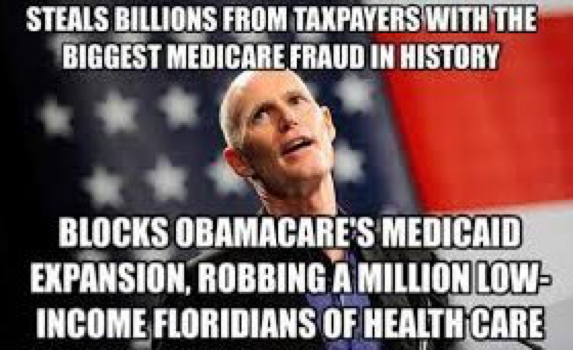 Rick Scott became the focus of the largest Medicare fraud case in S. history, spanning six states during a seven-year criminal probe. Mr. Scott resigned from Columbia/HCA four months later under pressure from the board of directors and was never charged with a crime. Columbia/HCA admitted to systematically overcharging the government by claiming marketing costs as reimbursable, by striking illegal deals with home care agencies, and by filing false data about use of hospital space. They also admitted fraudulently billing Medicare and other health programs by inflating the seriousness of diagnoses and to giving doctors partnerships in company hospitals as a kickback for the doctors referring patients to HCA. They filed false cost reports, fraudulently billing Medicare for home health care workers, and paid kickbacks in the sale of home health agencies and to doctors to refer patients. In addition, they gave doctors loans never intending to be repaid, free rent, free office furniture, and free drugs from hospital pharmacies. During a July 27, 2000, deposition in a civil lawsuit involving an unrelated contract dispute, Scott refused to answer questions by invoking his right to Fifth Amendment protection from self-incrimination 75 A maneuver that can be legally applied only when the witness suspects he is the target of criminal investigation. self-incrimination and may be guilty of obstruction of justice. 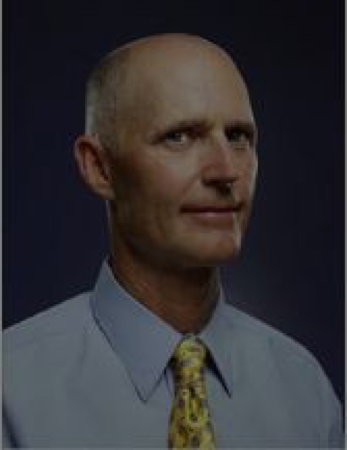 Mr. Scott, if I were asked this question: Who do you think is more of a threat to the lives of the average Floridian, Gov. Rick Scott or 19-years-old mentally unstable Nikolas Jacob Cruz? Without hesitation, I would say that you are. You sir, while as chief executive of Columbia/HCA, clearly demonstrated a gross lack of respect for rule of law and more recently lack transparency and accountability in the governor’s office. In 2015, you agreed to spend $700,000 in taxpayer money to settle seven (7) public records lawsuits alleging you and several members of your staff violated state law when y’all created email accounts to shield y’all communications from state public records laws and then withheld the documents. The settlement, first obtained by the Herald/Times Tallahassee Bureau, is precedent-setting in that it is the first time in state history that a sitting governor and attorney general have been sued successfully for violations of Florida’s public records laws. Mr. Scott, you had previously claimed those accounts didn’t exist. Those claims weren’t true. But it’s the use of public funds while as governor, that Florida’s taxpayers have been soaked for more than $1 million to settle lawsuits in which you and your dim-bulb Cabinet flagrantly violated Florida’s open-records and open-meetings laws. No other sitting governor has used tax money to end public-records cases that were caused by his own secretive misbehavior. You, sir, demonstrated that you couldn’t care less. Hopefully, the next governor of Florida will bring back honor and integrity to the Governor’s Mansion. I believe that I have found that individual. On Wednesday, after we learned of the massacre that took the lives of 17 students and educators at Stoneman Douglas High School in Parkland, I said that it is immoral to allow this senseless violence to continue plaguing our communities and robbing our children of their lives. Today, I’m taking action. I’m calling on Governor Rick Scott to issue an emergency order immediately suspending the permitting and sales of AR-15s and similar assault weapons. If you agree, will you add your name to my petition? The AR-15 assault rifle is the same weapon that was used in some of the most recent and deadliest shootings in America, including at the Pulse Nightclub in Orlando and at Sandy Hook Elementary School in Newtown, Connecticut. It’s a weapon that has murdered countless Americans and continues to threaten our communities every day that it’s sold. It is disgraceful that a troubled 18-year-old can purchase such a weapon faster and easier than a handgun. But suspending the permitting and sales of military-style assault weapons must only be the first step in a thorough reckoning with gun violence. Governor Scott and the Florida legislature have sat on their hands too long. It’s long past time for the legislature to finally act on common sense gun safety proposals, including strengthening background checks, banning large capacity ammunition magazines, removing guns from domestic abusers, and imposing a ban on military-style assault weapons. My message for Florida’s elected officials is this: Don’t turn off the TV, don’t vacation over your long weekend. Listen to what the students of Stoneman Douglas High School have to say. Listen to the grief-stricken parents. They are demanding your action. Don’t wait until the next mass murderer gets his hands on a weapon. Friend, will you join me in calling on Governor Scott to immediately suspend the permitting and sales of military-style assault weapons? As a Floridian and a mother, I promise to do all that I can to create the change we need to prevent tragedies like Parklands in the future. loyalty lies. 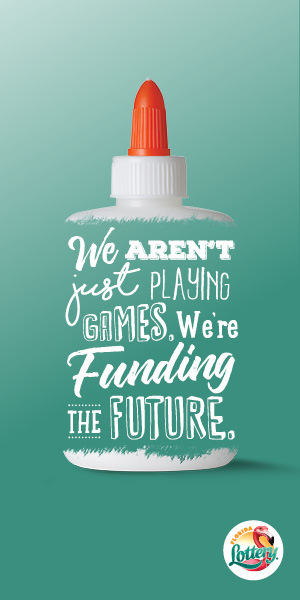 Is it with the people of Florida and our most precious asset, the lives of our children, our babies. Or will your loyalty remain with the special interest? Sir, personally I know where your loyalty lies. But I can assure you it won’t take YOU to the United States Senate. 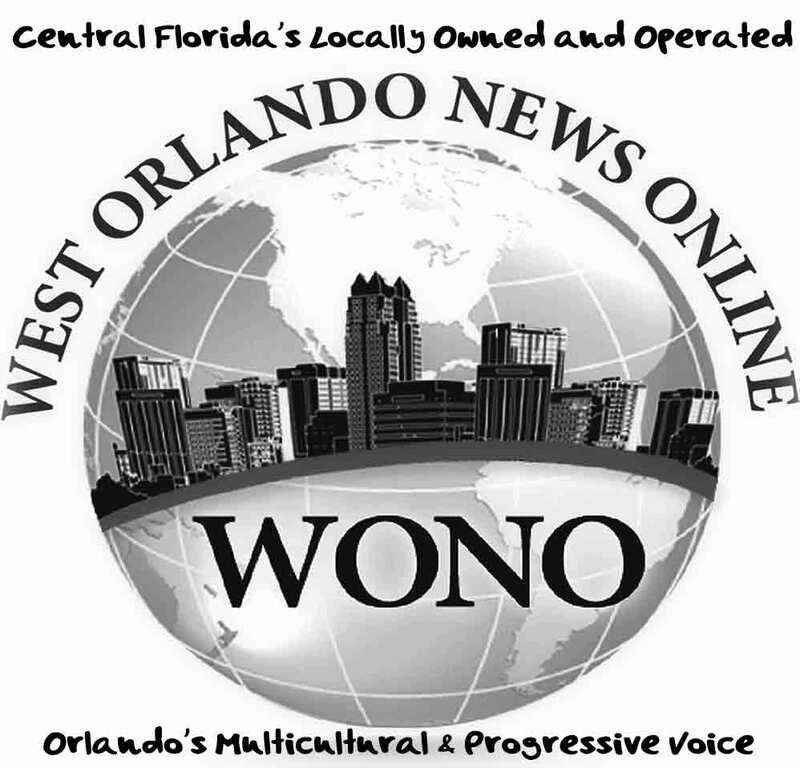 Please do the right thing and not enter into Florida’s U.S. Senate race. February 12, 2018: Evening Revelation Scriptural Series, By Ezell Harris Jr. 35th Installment of ‘Spiritual Food For Thought.’… MATTHEW 26:52…. Would it be fitting for a Christian to keep a firearm, such as a handgun or a rifle, for protection against other humans? In Jehovah’s eyes, life—especially human life—is sacred. The psalmist David knew that Jehovah “is the source of life.” (Psalm 36:9) Hence, if a Christian chooses to take reasonable measures to defend himself or his property, he would do everything in his power to avoid taking a human life and becoming bloodguilty.—Deuteronomy 22:8; Psalm 51:14. Although using any number of objects could lead to incurring bloodguilt, guns make it easier to kill someone—accidentally or deliberately. Moreover, if an attacker—who may already be tense—sees that the other person has a firearm, the situation is very likely to escalate and a death might result. “Put away your sword,” Jesus told him. “Those who use the sword will die by the sword. In harmony with Micah 4:3, God’s people “beat their swords into plowshares and their spears into pruning shears.” This identifying trait of true Christians harmonizes with the apostle Paul’s inspired exhortation: “Return evil for evil to no one. . . . If possible, as far as it depends on you, be peaceable with all men.” (Romans 12:17, 18) Despite the many troubles that Paul experienced, including “dangers from robbers,” he lived by his words, never putting personal security above Scriptural principles. (2 Corinthians 11:26) Instead, he trusted in God and in the wisdom found in His Word—wisdom that “is better than weapons of war.”—Ecclesiastes 9:18. Christians consider life to be far more valuable than material things. “Life does not result from the things [a man] possesses.” (Luke 12:15) Thus, if a mild tongue fails to stop an armed robber, wise Christians heed the principle embodied in Jesus’ words: “Do not resist the one who is wicked.” It may even require that we give up our inner and outer garments, so to speak. (Matthew 5:39, 40; Luke 6:29) The best strategy, of course, is prevention. If we shun “the showy display of [our] means of life” and are known by our neighbors as peace-loving Witnesses of Jehovah, we may avoid being targeted by violent criminals.—1 John 2:16; Proverbs 18:10. Christians respect others’ consciences. (Romans 14:21) If it became known that a member of the congregation kept a gun for protection against humans, some fellow believers might be shocked, even stumbled. Love moves us to put others’ interests ahead of our own, even when that means putting aside what we may feel is a legal right.—1 Corinthians 10:32, 33; 13:4, 5. Christians strive to be exemplary. (2 Corinthians 4:2; 1 Peter 5:2, 3) After receiving Scriptural counsel, a Christian who continues to keep a gun for protection against other humans could not be considered exemplary. He would therefore not qualify for responsibilities or special privileges in the congregation. The same applies to a Christian who continues to carry a firearm as part of his secular work. How much better to seek other employment! How a Christian chooses to protect himself, his family, or his possessions is, of course, largely a personal matter, as is his choice of employment. That said, Bible principles reflect God’s wisdom and his love for us. Out of regard for those principles, spiritually mature Christians choose not to keep a firearm for protection against other humans. They know that true and lasting security comes to those who demonstrate trust in God by living in harmony with Bible principles.—Psalm 97:10; Proverbs 1:33; 2:6, 7.